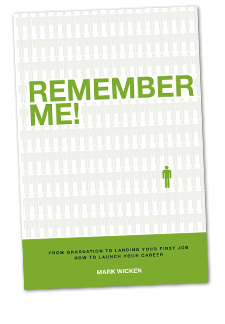 Greetings, I’m Mark Wicken and you are probably on this website because you are getting ready to start your job search… One that will launch your career. Launch Your Career is a website created specifically to address the needs of graduating students and first-time job seekers providing you with simple, useable, and actionable information to guide you through your first job search. It is important to understand that when you leave school all graduates will look the same to the job market. No one really knows who you are… you will all have your degree or diploma and your resumé… but little or no real practical experience in the field of study you want to enter. So how is a potential employer going to determine if you are the right person for the job and how are you going to differentiate yourself from the competition? All this will happen by the way you behave and present yourself during the job-search process. From the all important first impression to the final interview, you will be judged every step of the way against the competition. The way you conduct yourself during your job search will be the best indicator the employer will have to determine if you could become a good employee. It is about helping you understand the complete hiring process and giving you information that will help you stand out from your competition and most importantly being “Remembered”.